The UNLV men’s golf team shot 9 over in Friday’s first round of the NCAA Championships in Stillwater, Oklahoma. The Rebels failed to take advantage of Shintaro Ban’s 5-under 67. UNLV golfer Shintaro Ban. Photo courtesy of UNLV athletics. Mountain West Player of the Year Shintaro Ban attacked the Karsten Creek Golf Club on Friday, registering birdies on nine holes and shooting a 5-under 67. 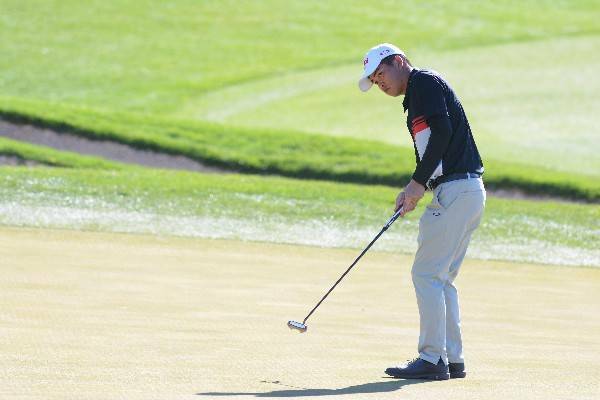 His teammates, though, failed to match that level of play, and UNLV finds itself far down the leaderboard after the first round of the NCAA Championships in Stillwater, Oklahoma. The Rebels shot a team score of 9 over, placing them 29th of 30 teams, with play suspended because of darkness and half the field still on the course. Only Augusta at 10 over had a worse day than UNLV. Northwestern leads at 8 under. Ban is tied with three other golfers for low score, though Texas Tech’s Ivan Ramirez and Clemson’s Bryson Nimmer had not completed their rounds. The individual champion is determined after four rounds. UNLV was scheduled to tee off in the second round at 10:42 a.m. Saturday, but rain delays could mean the Rebels won’t hit the course until mid to late afternoon. Their biggest concern wasn’t the weather, but difficulties on par 5s. Ban birdied all four, but the other Rebels combined to shoot 9 over. * Did not finish round.